Just a few blocks south of Lower East Side deli mainstays Russ & Daughters and Katz’s is a new modern deli counter and grocery: Orchard Grocer. 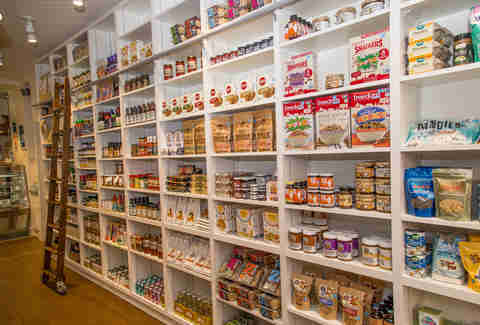 Here, the shelves are filled with specialty products like Sir Kensington’s Ketchup and organic rice ramen, and there’s a tidy case of packaged products that at first glance look like standard sliced salami and bricks of cheese. But there’s just one thing missing: animal products. Completely vegan, Orchard Grocer recreates iconic New York sandwiches without the formerly requisite dairy and meat. 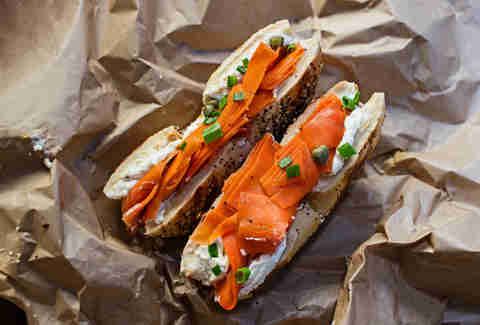 Sandwiches like The Edith, with house-made cashew “cream cheese” and carrot “lox" on a toasted bagel, and The Marlowe, a "reuben" with beet-brined seitan, kraut, house-made Thousand Island, and melted Chao cheese on marble rye, reimagine what New York deli sandwiches can be. But do they stack up to the originals? Orchard Grocer is co-owned by Sara and Erica Kubersky -- the proprietors (and sisters) of neighboring vegan shoe store MooShoes -- and Joya Carlton, who has created veg-centric menus for Butcher's Daughter and Buvette. The Kuberskys first came up with the idea for a vegan restaurant after realizing how frequently they referred shoppers at their shoe store to local eateries offering cruelty-free dishes. So, why not keep all the business in-house? Growing up in Queens, the Kuberskys often “schlepped” down to the Lower East Side for Jewish food, a pastime that shifted when Erica went vegetarian, and then vegan as a kid. “It broke my mom’s heart, just a little,” Erica says of her decision to stop eating meat-heavy Jewish foods. But her mother didn’t give up: She sourced tofu cream cheese from Zabar’s, tried to recreate brisket from seitan, and cooked a vegan version of noodle kugel. Vegan Jewish food was indeed possible. And in 2017, when by CHLOE.’s plant-based mac & cheese, burgers, and kale ice cream draw long lines of vegan and non-vegan New Yorkers alike, the Kuberskys’ vegan Jewish fare seemed like a no-brainer. Since its early March opening, Orchard Grocer has mostly seen customers looking for the Jewish food they sacrificed after becoming vegan -- others, including meat lovers, are just coming in for a good-tasting sandwich. No one expects a Katz’s reuben on rye, dripping in pastrami fat and creamy Thousand Island dressing to be considered healthy by any means, yet labeling any sandwich vegan (even the fast-food-style veggie burger at by CHLOE.) seems to easily convince many that it’s a more nutritious choice. Still though, without meat and dairy products, a vegan sandwich is still a sandwich, loaded with high-calorie ingredients between two slices of bread. Because Orchard Grocer is a small business, all the products are small-batch, made fresh, mostly organic, mostly local, and palm oil-free, making the menu offerings healthier than bigger businesses producing vegan food en masse, like by CHLOE. To develop the recipes, Carlton tested various vegetables and other ingredients that would not only re-create the appearance and texture of their animal-made counterparts (smoked salmon’s spongy texture was eventually made from carrots soaked in aquafaba, the juice drained from chickpeas), but would also evoke the feelings associated with standby comfort foods. At first glance, the Marlowe reuben could easily pass for non-vegan: The beet-brined seitan looks like cured beef, and the vegan Thousand Island dribbling down the rye doesn’t hint at being made from chickpea juice. And at first bite, though it’s obvious there’s no meat on this sandwich, the pickled sauerkraut and salty, red-hued seitan combined between bread truly mimic the original. Carlton wouldn’t know that though; she didn’t conduct any taste tests with the non-vegan original sandwiches. “No, no, gross!” she laughs at the thought of trying beef. Still, she thinks her beef-like creations may help recent veggie converts acclimate to their new meat-free life. Melissa Kravitz is a writer based in NYC who was a vegan for a couple of days as a teenager. Follow her on Twitter.